The rivalry between the University of New Brunswick Varsity Reds and the St. Francis Xavier X-Men will reach its apex Sunday night in Halifax when the two meet for the 2016 University Cup. Game time is 6:30PM and it will be broadcast nationally on Sportsnet 360. For the Varsity Reds, they will be looking for redemption on three fronts tonight. First, they will be looking to avenge the two game sweep St. FX administered to them in the AUS Final 11 days ago. They will also trying to make up for last year's loss in the final to Alberta, a game in which all but three players UNB has dressed so far in this tournament (Christopher Clapperton, Marcus McIvor, and Etienne Marcoux) played in. Also, although it was before any of these current players time, I am sure head coach Gardiner MacDougall would love to return the favour for 2004, when St. FX defeated UNB 3-2 in overtime at the Aitken Centre to claim their lone National Championship. That game remains the only meeting at the University Cup between the two schools. Overall, UNB will be making their 11th appearance in the National Championship game, including their 7th in the last 10 years. It will be the 8th appearance since Gardiner MacDougall took the helm in 2000/2001. They will be looking for their 6th championship of all-time. - UNB's 11 previous appearances rank behind only Alberta (20) and Toronto (13) all-time. - Their 5 losses are tied with Alberta, Saint Mary's, and Saskatchewan for the most all-time. - This will be the 5th all-AUS National Championship game. UNB has been involved in all of them. - This is the first time UNB has played 3 games in 3 days since doing it December 28th-30th, 2007 as part of that year's Pete Kelly Cup. - UNB will be the road team in the game. They have never won a National Championship wearing their dark sweaters. - This will be the last game as a Varsity Reds for 5th year players forwards Tyler Carroll and Taylor MacDougall and defenceman Alex Wall. Carroll and MacDougall will be playing in their 3rd CIS Final and will be seeking their 2nd University Cup. - This is the 7th meeting of the season between UNB and St. FX. Today is the rubber match as each team has three wins so far. - UNB will be looking for a repeat of 2007, when they lost in the AUS Final to Moncton before defeating the Aigles Bleus in National Final. - If anyone is planning on making the trip to Halifax for the game, we advise that you get your tickets beforehand. As of this afternoon the lower bowl of the Scotiabank Centre is completey sold-out. However, there are still tickets available in the upper bowl, which up to this point in the tournament has been curtained off. - If yesterday's St. FX/Saskatchewan game is any indication, this will definitely be a hostile, road environment for the V-Reds. The alumni support for the X-Men is impressive and they probably made up about 90% of the crowd yesterday. Expect there to be even more tonight. - Much like the game against Saint Mary's, at this point these two teams, coaching staffs, fans pretty much know everything there is to know about the opposition. There are no surprises at this point. It will all come down to what team executes better and gets the goaltending, bounces, and breaks. - What is your prediction? Who takes home the 2016 University Cup? It's Philippe Halley's world and we're all just living in it. The 3rd year forward scored another three goals - giving him an incredible three hat-tricks and 10 total in his last four Universitu Cup games - and the # 5 ranked University of New Brunswick Varsity Reds stifled the # 8 ranked Saint Mary's Huskies 4-0 tonight in Halifax. UNB will now face the St. FX X-Men tomorrow evening for the 2016 University Cup. The Varsity Reds got out to a fast start, taking the game's first 6 shots, and were rewarded at 3:37 when Christopher Clapperton knocked Philippe Maillet's centring pass out of mid-air and past Huskies goalie Cole Cheveldave. That was the only goal in a period in which UNB out-shot Saint Mary's 11-5. Perhaps the turning point in the game came when the V-Reds took their second penalty in 39 seconds at 7:02 of the 2nd period while still nursing a one goal lead. UNB held the fort, though, and got some big saves from Etienne Marcoux to successfully kill off the two man disadvantage. If that was the turning point of the game, Philippe Halley's (Carroll) first goal of the game with only 17 seconds left in the period might have been the back breaker. After a lengthy shift in the offensive zone Halley got a pass in the slot and fired a wrist shot between Cheveldave's legs to make it 2-0. Both teams had 8 shots apiece in the period. UNB clamped down defensively in the 3rd period, not surrendering a single shot on goal in the final 20 minutes while taking 13 of their own. They converted on two of those shots, both by Halley. At 8:49 the 3rd year forward picked up the puck at the Huskies blue line and streaked down the left side, getting in all alone on Cheveldave. Halley went forehand to backhand, depositing the puck into the top right corner for a 3-0 lead. Halley completed his 2nd hat-trick in as many days at 12:32 while in the power play. He got the puck near the hash marks and fired a shot that made its way through a maze of bodies and into the net. Randy Gazzola and Francis Beauvillier picked up the assists on the final goal of the game, which was UNB's first with the man advantage in four games. - UNB dressed the same line-up as Friday with Peter Trainor, Mike Thomas, Stephen Anderson, and Chris Caissy all out. - Shots in the game were 32-13 in the game. - The V-Reds went 1 for 5 on the power play while also continuing their strong penalty killing so far this tournament, killing off all 5 Huskies opportunities. They are now 9/9 in the two games. - Halley and Matt Tipoff were named the players of the game. - UNB won 38 out of 72 face-offs. Dylan Willick (10 for 17) and Taylor MacDougall (11 for 19) both had strong nights at the dot. - The Varsity Reds will now get the chance for revenge when they face the St. FX X-Men, who just swept UNB in the AUS Final 11 days ago, in the National Championship game Sunday night. Game time is 6:30 AST and it will be broadcast nationally on Sportsnet 360. - The Huskies will play the Saskatchewan Huskies at 2 PM in the bronze medal game. Anthony Repaci scored a pair of goals and Ben Duffy scored the eventual game-winner with just over 6 minutes remaining to lift the #8 ranked Saint Mary's Huskies to a 3-2 win over the #1 ranked UQTR Patriotes in an entertaining, back and forth, contest in front of 5817 tonight in Halifax. The Huskies will now meet the Varsity Reds in tomorrow's 4PM semi-final. Repaci got the Huskies on the board first with the lone goal of the opening period at 12:20 when he drove towards the net and redirected a Stephen MacAulay centring pass up and over Patriotes goalie Sebastien Auger. However, a Huskies penalty at the end of the period proved to be costly as Jeremy Beaudry jumped on a loose puck in the slot to tie the game just 32 seconds into the 2nd period. Although both teams traded chances up and down the ice, the game would remain tied 1-1 until 7:37 of the 3rd period when Repaci, while on the power play, got the puck on the goal line and had all kinds of time and space to skate out front and put the puck up and under the crossbar for his second of the game. Duffy would make it a 3-1 game at 13:57 after a long Huskies shift in the offensive zone. He collected a rebound from a point shot just outside the crease and backhanded the puck off the far post and in to give Saint Mary's some breathing room. The Patriotes made it 3-2 with only 46 seconds remaining on a goal by CIS Player of the Year Guillaume Asselin, but it was too little too late for the Patriotes. UQTR won an offensive zone face-off with just over 10 seconds remaining, but the puck split their defense and went back to the neutral zone, effectively ending any chance they had of pulling off a miracle. - Shots were 33-29 for SMU. - SMU was 1 for 4 on the power play. UQTR was 1 for 5. - The Patriotes had won 16 straight games coming into this one. - With St. FX and UNB already moving on to the semi-finals, the AUS represents 3 out of the final 4 teams left standing. - Tomorrow's UNB/Saint Mary's game will be broadcast live on Sportsnet 360. Game time is 4PM and a trip to Sunday's National Championship game is on the line. The #5 ranked University of New Brunswick Varsity Reds received three goals from Philippe Halley on their way to a resounding 5-1 victory over the #4 ranked Western Mustangs in their quarterfinal game at the University Cup this afternoon in Halifax. The V-Reds will now face AUS rival Saint Mary's in the 4PM semi-final at the Scotiabank Centre. This game was never really in doubt as UNB had a 3-0 lead after a dominant 1st period in which they out-shot the Mustangs 14-3. Halley (Mignardi) got his first of the game at 8:40 when he fired a shot from the slot just under the crossbar that beat Mustangs goalie Greg Dodds. The V-Reds would strike again just 52 seconds later while shorthanded when Matt Petgrave (Willick, Suellentrop) lifted a high arching shot from the neutral zone that fooled Dodds, one that he surely would love to have back. Halley's 2nd of the game, from Murray and McIvor, came at 15:14 when he got to a loose puck in front of the net and put it between Dodds' legs. UNB had a chance to extend their lead, but Cam Braes was stymied on a penalty shot after attempting a nifty deke move. The 2nd period was scoreless even though the V-Reds kept up the pressure and out-shot the Mustangs 15-5, including a number of high quality chances that Dodds somehow kept out. UNB put the game away with a pair of goals early in the 3rd period. At 1:59 Cameron Brace converted a Francis Beavillier pass for a one-time goal from between the hash marks, taking an ugly cross-check in the back in the process, but he remained in the game. Then, at 6:44, Halley (Gazzola, Wall) completed his hat-trick when he took a rebound at the side of the net, patiently waited until Dodds was out of position, circled behind the net, and wrapped the puck around the post before the goalie could recover. The Mustangs broke Etienne Marcoux's shutout bid with a shorthanded marker on a breakaway by Cody Brown at 14:26. Shots favoured UNB 16-7 in the period and 45-15 in the game. - Scratches for UNB included Peter Trainor, Stephen Anderson, Mike Thomas, and Chris Caissy. Matt Boudens was back up front playing forward after a number of games playing defence. - UNB was 0 for 7 on the power play, probably one of the few things they didn't do right today. Western was 0 for 4. - Although Marcoux wasn't tested often, especially in the first two periods, he stopped a couple nice chances early in the 3rd period after the Mustangs were able to get in all alone. - The teams split the 76 face-offs in the game, each winning 38. Dylan Willick won 15 out of 20. - Rob Mignardi left the game in the 1st period after being shaken up after attempting to level a Western player. He appeared to be favouring his leg. - Halley and Brown were named the player of the game for their respective teams. - Halley also had a four goal game against Guelph at last year's University Cup. His 7 career University Cup goals eclipses Daine Todd's 6 for most in UNB history. - The Mustangs coach Clarke Singer called UNB "the best team we have faced all year" and offered nothing but praise for the V-Reds in his post-game press conference. - UNB is now 4-1 all-time against Western. - The Varsity Reds move on to face a familiar foe in tomorrow's semi-final - their AUS rival the Saint Mary's Huskies. UNB went 3-1-0 against SMU this year and at this point there really aren't any surprises between the two squads. 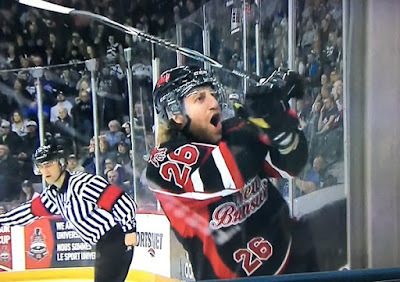 - The only time these two have faced each other in the University Cup was in 2013 when UNB won 2-0 in the National Championship game in Saskatoon. The Huskies will no doubt be looking to avenge that defeat in front of their hometown fans. The V-Reds will be playing in a hostile environment, but they have had success in this situation in the past (see UdeM in Moncton in 2007, Lakehead in Thunder Bay in 2009, Saskatchewan in Saskatoon in 2013). It should be a dandy. - The game is scheduled for a 4PM AST puck drop. The other semi-final, pitting Saskatchewan and St. FX, goes at 12PM AST. both games will be broadcast nationally on Sportsnet 360. The AUS Champion and #3 ranked St. FX X-Men spotted the defending champion and #6 ranked Alberta Golden Bears a 2-0 lead after twenty minutes, but then reeled off 6 consecutive goals over the final two periods in a 6-2 win before 5823 in attendance tonight in Halifax. Alberta received goals from Jamie Crooks and Riley Kieser just over two minutes apart late in the 1st period and looked well on their way to advancing. However, the X-Men showed the resiliency AUS fans have come to expect over the years by striking for 3 goals in both the 2nd and 3rd periods. Michael Clarke led the way with a hat-trick with Adam Stevens contributing a pair and Zack MacQueen notching the other. In what has been a trend in almost every Alberta loss this year, the Bears dominated the shot-clock with a 45-27 advantage, but once again their defence and goaltending wasn't quite up to par with recent years - especially last year's University Cup-winning squad. The X-Men will now advance to face the Saskatchewan Huskies on Saturday in one semi-final. Game time is 12 PM and it will be broadcast on Sportsnet 360. Parker Thomas' goal 6:11 into the 4th overtime period lifted the #2 ranked Saskatchewan Huskies over the #7 Carleton Ravens by a 3-2 score in the longest game in University Cup history this afternoon/evening in Halifax. Levi Cable (12:40 into the 1st period) and Kohl Bauml (5:58 of the 2nd) had the other goals for Saskatchewan, who never trailed in the game. Brent Norris (2:11 into the 2nd period) and Brett Welychka (15:20 of the 2nd) replied for the Ravens. Jordon Cooke showed why he was named the CIS Goaltender of the Year by making 59 saves. Patrick Kileen was the hard luck loser despite stopping an amazing 68 shots. The Huskies will now advance to Saturday's 12PM semi-final where they will meet the winner of the upcoming St. FX/Alberta game, which will begin in an hour. Varsity Reds defenceman Jordan Murray was named the CIS Defenceman of the Year at the CIS Men's Hockey Awards Gala tonight in Halifax. He was also named a 1st team all-Canadian. Other winners on the evening included UQTR's Guillaume Asselin (player of the year), Saskatchewan's Jordon Cooke (goaltender of the year), Carleton's Brett Welychka (rookie of the year), Calgary's Elgin Pearce (most sportsmanlike), St. FX's Brad Peddle (coach of the year), and St. FX's Nathan Chiarlitti (hockey, academics, and community service). Although the 2016 University Cup kicks off tomorrow afternoon in Halifax, the #5 ranked University of New Brunswick Varsity Reds won't be hitting the ice until Friday when they entertain the #4 ranked, and OUA runner-up, Western Mustangs at 4PM. This will be the 5th meeting all-time between the schools, all of which have taken place at Nationals. UNB has won 3 out of the 4 previous meetings. This year's edition of the Mustangs finished the season 18-10-0, which was good enough for 2nd place in the OUA West division, just one point behind the division-leading York Lions. In some ways their season resembled that of the V-Reds. They won their first five games - and 9 out of their first 11 - before hitting a rough patch before the Christmas break where they lost 6 out of 7 games. They eventually recovered to go 8-2-0 to end the season. The Mustangs hovered in and out of the top ten rankings all season. They received votes in all but one poll but were only ranked higher than 8th twice all year (5th on October 27th and 6th on March 8th). The Mustangs opened the playoffs with a sweep of Laurier, but then lost their first game against Toronto to push them to the brink of elimination. They came back with consecutive wins to knock off the Varsity Blues, including an overtime win in the 3rd and deciding game. They also needed three games to dispatch Guelph in the division finals, which advanced them to the Queen's Cup against UQTR. Despite taking a 3-1 lead into the 3rd period the Mustangs fell to the Patriotes 4-3 in overtime. Western has kind of flown under the radar all season long, as evidenced by the fact they did not have one single player named to the OUA West 1st all-star team, 2nd all-star team, or all-rookie teams. This is not entirely surprising given they did not have anyone rank among the top-50 point producers in the country. They are led offensively by Matt Marantz (5 goals, 21 assists in 24 games) and Shaun Furlong and Andrew Goldberg, each of whom had a team-high 9 goals. They also feature former St. Thomas Tommie Stephen Sanza, who collected 5 points in 11 games after joining the team at the Christmas break for his final season of eligibility. On defence Alex Micallef led the way with 15 points in 26 games. Alex Dodda has carried the bulk of the load in net, appearing in 17 games and going 11-4-0 with a 2.64 GAA and 0.919 save percentage. Looking at the Mustangs team stats, they appeared to have a decidedly average season. They ranked 10th (out of 37 teams) in the country in goals scored (3.68), 16th in goals against (3.00), 18th in power play (17.7%), and 18th in penalty killing (84.4%). By comparison, UNB ranked 2nd in goals scored (4.64), 2nd in goals allowed (2.18), 20th in power play (17.1%), and 11th on the penalty kill (84.8%). Overall, much like last year against Windsor and Guelph, the Varsity Reds should emerge victorious in this game as the Mustangs have less impressive numbers despite playing in an easier conference than UNB. This might be game that remains close for awhile, but UNB's depth and relentless attack should eventually prevail. However, as we saw when these two teams met in 2012, anything can happen in a one game situation. The Varsity Reds have had a tendency this season to make some glaring defensive gaffes as well as take a high number of penalties. If those problems arise again for UNB, they will have a battle on their hands. In fact, the Mustangs only accumulated 339 penalty minutes this season to UNB's CIS-leading 720. The X-Men won the special teams battle in the AUS Final and it was probably the biggest reason - along with goaltending - why they won the series. Although Western is ranked higher going into this game - and will be the home team as a result - everyone is predicting an easy UNB victory with a Western win being seen as a monumental upset. However, if the Mustangs can take advantage of their chances and maybe get a break or two this could be one of those games where the score is tight, but the shots are 38-23 for UNB. I'm not counting on it though. The V-Reds have historically dominated OUA teams and they will be motivated by their loss to St. FX to show everyone why they should be considered one of the teams to beat this weekend. The CIS has released their annual University Cup preview. It is, as always, chock full of everything you need to know about all eight participating teams. You can check it out here. With the CIS playoffs wrapping up last night we now know all 8 participating teams at this week's University Cup, which begins on Thursday afternoon in Halifax. By examining the 8 teams who will take part in the tournament we can use the 2015-2016 CIS Men's Hockey Playing Regulations to get a very good idea how the bracket might look. Based on this we should be able to accurately predict how the bracket will shape up. This means that UQTR (OUA Champion), Saskatchewan (CW Champion), and St. FX (AUS Champion) must be seeded 1st, 2nd, and 3rd. Those three teams were ranked 2nd, 3rd, and 4th respectively in the last Top 10 poll. Although there will be one more, unpublished, top 10 poll conducted I think it is unlikely that the order of these three teams changes. Based on this it is reasonable to assume UQTR will be seeded #1, Saskatchewan #2, and St. FX #3. The Western Mustangs were the OUA West divisional champions and OUA runner-up. Thus, they are #4. Again, there should be one more Top 10 poll released, but if we look at last week's rankings UNB was ranked #1, Alberta #5, Carleton #7, and Saint Mary's #8. Essentially, number 4 just states that 3rd place teams from the OUA (Carleton) and AUS (Saint Mary's) can't be ranked higher than the 2nd place teams from the AUS (UNB) or Canada West (Alberta), which isn't the case anyway so it is a moot point. However, this season there are no first round match-ups that involve teams from the same conference so it is likely the above is how the final seeding will look. According to all of the above #1 UQTR/#8 Saint Mary's and #4 Western/#5 UNB will be the quarter-final match-ups on one side of the draw and #2 Saskatchewan/#7 Carleton and #3 St. FX/#6 Alberta will be the quarter-final match-ups on the opposite side. One drawback to this schedule is the possibility of having an all-Canada West semi-final between Saskwatchewan and Alberta on one side of the draw and either an all-AUS (UNB/Saint Mary's) or all-OUA (UQTR/Carleton) semi-final on the other side of the draw. Since the CIS is more concerned with avoiding intra-conference match-ups in the first round this is result. So while it is not ideal, it is really the only possible set-up. In terms of the schedule, Saint Mary's has already confirmed they will be playing Friday night (again, most likely against UQTR). This means that the other game on their side of the bracket (Western/UNB) will be played on Friday afternoon. It is also highly probable the organizing committee will prefer St. FX to play their game against Alberta on Thursday night for attendance purposes, which puts the Saskatchewan/Carleton game will get the Thursday afternoon slot. The CIS is expected to announce the official seedings and schedule this afternoon. The CIS playoffs wrapped up tonight with the Carleton Ravens knocking off the visiting Guelph Gryphons 4-1 to capture the final berth at the University Cup and the UQTR Patriotes defeating the Western Mustangs 4-3 in overtime to win the Queen's Cup/OUA Championship. The latter result is significant for the Varsity Reds as it is highly likely they will now meet the Mustangs in their first round match-up. The official tournament schedule will be released tomorrow afternoon. The UQTR Patriotes and Western Mustangs both clinched berths at the University Cup by virtue of series victories over the weekend. This means 7 out of the 8 spots at the tournament are now filled with the Guelph Gryphons and Carleton Ravens facing off Saturday to determine the final berth. The AUS Final will finally get underway tomorrow night when the University of New Brunswick Varsity Reds welcome the rival St. FX X-Men to to the AUC for game 1 of the best 2-of-3 series. While both teams have already clinched a berth at next weeks University Cup the winner of this series will be guaranteed a top-3 seed at the tournament, while the loser can not be ranked any higher than 5th. As mentioned earlier this week the V-Reds and X-Men are certainly no strangers to one another at this time of the year. Although UNB has come out on top in 5 of the last 6 playoff meetings, the last two - 2011 and 2015 - have both gone the distance. We can probably expect something similar this year as three out of the four regular season games were decided by a single goal, with two going into overtime. Overall, the Varsity Reds went 3-1-0 against X this year while St. FX went 1-1-2 against UNB. On October 16th Randy Gazzola scored the OT winner to lift UNB to a 4-3 home win. The X-Men prevailed 6-5 at home on November 20th as the V-Reds were going through a tough stretch due to a number of injuries at the time. UNB swept both 2nd half meetings. This included a 6-2 home win on January 9th in a game that was marred by 192 minutes in penalties and a 3-2 OT win in Antigonish on January 16th with Jordan Murray getting the winner. Defensively, the X-Men also ranked 4th with 75 goals allowed. This was higher than last year but as many AUS fans know, goaltender Drew Owsley (24 GP, 2.54 GAA, 0.914) is more than capable of stealing a game. The X-Men also struggled on the penalty kill this season, again placing 7th in the conference with a 81.7% percentage. The X-Men will also have to make due without the services of defenceman Max Iafrate for the duration of the series as he was given a 4 game suspension after picking up a major penalty in game 3 of their semi-final series against Saint Mary's. Overall, the X-Men will undoubtedly provide another stiff test for the V-Reds thanks to their improved offense and always strong defensive play. They key for UNB, like it always is against St. FX, will be to get the lead and force the X-Men to play their style of game. If the X-Men take a lead and go into a defensive shell we have all seen how effective and frustrating that can be for the V-Reds. I don't expect the X-Men to generate the same number of shots and scoring chances as UNB so the Varsity Reds - and goaltender Etienne Marcoux - will need to ensure St. FX doesn't take advantage of their limited opportunities to give them any confidence and momentum. I expect the series to be tightly contested and would not be surprised to see an overtime game (or even a 3rd game), but the V-Reds are just on too much of a roll right now and appear to be as healthy as they have been in quite sometime. As long as UNB plays their game they should prevail and capture another AUS Championship. Just a reminder that today is the last day to bid on the the "blank" UNB Varsity Reds Camo Jersey, which was created for Military Appreciation Night on February 5th, 2016. Follow the link for more information and to place a bid. The AUS has announced the full schedule for the upcoming best 2-of-3 AUS Final between the St. FX X-Men and UNB Varsity Reds. We already knew that game 1 was taking place Monday night at the AUC, but we now know game 2 will be held Wednesday in Antigonish and game 3, if necessary, will be back in Fredericton on Friday, March 11th. All games are scheduled for 7PM and will be streamed live at AUStv.ca. The V-Reds and X-Men are certainly no stranger to one another at this time of the year. This will mark the 9th playoff series between the two teams since Gardiner MacDougall took over as head coach in, the most common playoff opponent for the V-Reds during that span (Acadia is next with 6 series) 2000-2001. This will be the 9th time the two teams have met in the playoffs since 2000-2001, the most common playoff opponent for the V-Reds during that span. UNB has gone 17-12 (13-3 at home, 4-9 on road) in winning 6 out of the previous 8 series. 7 of those game have gone into overtime. - This is the 3rd time the two have faced in the finals with UNB winning both of the previous instances (2003 and 2011). - The last two series have gone the distance, with Kyle Bailey's overtime goal in game 5 clinching an AUS Championship on home ice in 2011 and the V-Reds blowing a 2-0 series lead before recovering to win game 5 in last year's semi-finals. - Each of the last 4 series were best 3-of-5 affairs. This is the first best 2-of-3 meeting since 2006. - Tickets for game 1 are now on sale, both online and at the AUC box office. Lets pack the rink and show why the Varsity Reds have the best fans in the country. AUS hockey final begins Monday, Mar. 7, 7PM, at the AUC. Tickets on sale, Wednesday, Mar. 2, 11AM. Let's pack it. Best Fans in CIS. - UNB's 10 AUS titles since 1984 are the most in the conference, ahead of the 6 won by both Moncton and Acadia. - Although they rank 2nd all-time with 14 AUS titles, UNB is still well behind the 24 championships won by St. FX. - This is UNB's 9th appearance in the final in the last 11 seasons. - It will also mark the 7th straight appearance where the V-Reds will have home-ice advantage. They have taken game 1 at home in each of the last 6 instances, ultimately winning 5 of those series.